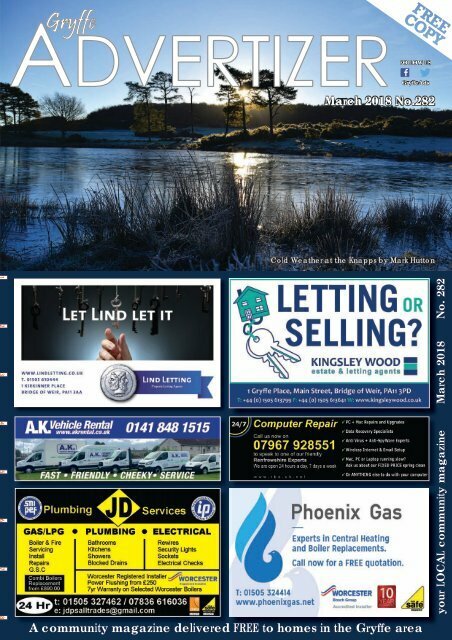 22 the advertizer Advice on reducing Home Energy Usage Sponsors wanted The search is on for sponsors for the Gryffe Valley 10K run on 29th April 2018! Sponsorship is the main method for generating proceeds for the chosen charity – which this year will be the Glasgow-based charity Funding Neuro (www.fundingneuro.com) which is researching novel possibilities for treating neurological conditions, including Alzheimer’s Disease, Motor Neurone Disease, MS and brain tumours (DIPG and Glioblastoma). Members are seeking sponsorship for the event, for individual runners and for teams of runners from clubs, organisations, schools, and streets. There will be a prize for the team which generates most sponsorship for Funding Neuro. More details from www.gryffevalley.rotary1230.org. Bill Mitchell - GVRC There was an excellent turn-out from the club members for the funeral of Bill Mitchell (1938-2018). Bill was a very well-liked former Bridge of Weir Round Tabler and one of 24 founder members of Gryffe Valley Rotary Club in 1995. He was born and bred in Paisley and married Marjorie at St Marks Church, Ralston. He had been an apprentice at Albion and had an early passion for cars and went on to work for Scot JCB where he was Regional Sales Director. He enjoyed golf and was a member, and a former Greens convenor, of Ranfurly Castle Golf Club. In 2014 when he was sadly already showing signs of Alzheimer’s, he enjoyed a visit with Rotary to the Malcolm’s Heritage Centre at Linwood where he was pictured with one of the first JCB’s to be sold in Scotland. Why not book you free Home Energy Check with LEAP and get free and impartial advice on the practical measures you could take to help reduce the amount of energy you use at home – at the same time you can discuss and plan the simple, inexpensive actions that would improve your home comfort. LEAP Home Energy checks are a free service to all local residents of Lochwinnoch, Bridge of Weir, Kilbarchan, Houston, Crosslee, Brookfield, and Renfrewshire wide. Home owners, tenants, landlords and private let tenants can all request a home energy check for FREE. To Book your Home Energy Check in March, call LEAP on 01505 612034/842530, email energy@myleapproject.org or pop into your nearest LEAP Office at either Advance Place, Bridge of Weir, or 22 Church Street, Lochwinnoch. Financial Blog by Carl Melvin, Affluent Financial Planning Ltd End of Tax Year Planning The tax year runs from 6th April to the following 5th April and the current tax year will end on 05/04/2018. The time that remains to the end of this tax year offers an opportunity to undertake some tax planning. Consider the following measures to ensure a more tax efficient future Make use of your tax-free investment allowance – Individual Savings Accounts (ISAs) allow you to tax shelter money in cash or investments. The allowance is £20,000 per person and if you don’t use your ISA allowance, you cannot carry it forward to the next year – you lose it! Consider making a pension contribution – you can achieve income tax relief at your highest rate paid (up to 45%) on the contributions you make. Even those under 75 who don’t pay income tax can save into a pension plan and get £720 tax relief from the Government. The taxman boosts your pension by £1 for every £4 pounds you save (more if you pay higher rates of tax) Get more than pension tax relief – if you make a pension contribution you could restore some or all of your tax free personal allowance or avoid a tapered annual allowance tax charge on the pension contributions you make, if you are a higher earner. Carry forward unused pension allowances – If you can pay a large pension contribution, you may be able to make use of any unused pension allowance from the past 3 years to boost your retirement funds and secure valuable income tax relief. This information is not fi nancial advice. If you require advice you should consult a professional adviser. The fi rst meeting is normally free and there is no obligation. Call us for a FREE fi nancial review on 01505 59 50 60 or email: info@ affl uentfp.co.uk. Alternatively, pop into the Affl uent offi ce opposite Amaretto restaurant on Main Street, Bridge of Weir. www.affl uentfp.co.uk deadline date for our april issue - Friday 16th March - You don’t want to miss it! !